1. What are recurring payments? Using recurring payments you can automatically purchase using your credit card a renew your FreshMail subscription. This option is available for you if you chose Unlimited plan. You don't need to remember to login every month and proceed with a renewal payment. The system will automatically charge your card when period of your subscription is about to expire. Changes that might be necessary for your subscription depend on the number of your subscribers and chosen plan. Your trial account will be deleted after 14 days from the date of opening it. If you want to continue using FreshMail upgrade to a paid plan, by visiting our Pricing page and selecting the plan you are interested. You can also contact our Customer Support Team (support@freshmail.com) to help you choose the paid plan that fits your needs best. 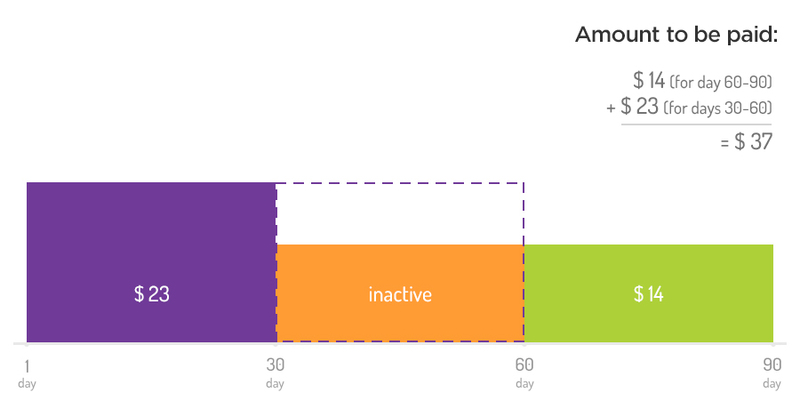 When you exceed any of the limits of the trial account, you won’t be able to send any more campaigns. You can not send a campaign, but you still manage your mailing lists and log in to your account. If you have not sent any campaign before your sending option has been blocked, delete the addresses above the limit and the option of sending campaigns will be automatically restored. However, if you have exceeded the limit of sent messages, the best solution will be to buy the appropriate paid plan. Then the option of sending campaigns will be automatically restored. To do this, log in to your account. 4. What do I do if I’ve used all of my credits under the Pay As You Go plan? If you have used all of your credit to send campaigns, you can simply get more credits. Until you replenish your account, you will not be able to send any more campaigns. You are not obligated to keep any credit on the your account if you don’t need to send any messages. Your credits are valid for 2 years. If for 90 days you do not have enough credits to send 1 campaign to all of your subscribers, we can delete your account. Your account can be deleted and you can lose access to your stored data if you do not log in for 12 months. 5. I chose the Unlimited plan and I haven’t paid for the next accounting period and the size of my database is the same as before. What can I do? If you do not make payments in time, you will not be able to send campaigns from your account. You can, however, log in to your account and access the settings. When you make the payment, an additional fee will be added for the period that we suspended the account and hosted the data. The amount of the fee depends on how much time passed before the account was paid up. You will receive a reminder five days before the payment is due and again one day before. If there is no credit card associated with your account or we are unable to receive funds from an existing card due to expiration or some other issue, you can make the payment by transfer. Again, you will receive reminder messages regarding the payment. If the payment is not made on time, the amount due will be increased according to the amount of time that FreshMail stored and hosted your account data. The additional charge will depend on how late the payment is made. 6. I chose the Unlimited plan for a certain amount of subscribers and my database has grown beyond the address limit for my plan - what will my payment look like? If you pay for a higher plan when you exceed the limit of addresses allowed on your current plant, a new accounting period begins on the day you pay for the higher plan. The fee for the first accounting period under the new, higher plan will be reduced by the pro-rated refund for the existing days on the previous month under the lower plan. Let’s say you pay $14 a month for 1,000 subscribers and in the middle of the month the size of your database exceeds what is allowed on your current plan. When you move to a higher plan - let’s say $23 for 2,500 subscribers - a new accounting period begins. For the first month of the new plan, you will pay $16 ($23-$7) as in the diagram below. The best option is to pay with a credit card attached to your account. This way, payments are made automatically and immediately when your database grows. If you pay for a higher plan for a larger database but you don’t make the payment immediately, the same situation described above applies but there is also an additional fee for the time period that FreshMail hosted your data but the account was inactive. Let’s say you pay $14 a month and in the middle of the accounting period - after 15 days - your database exceeds the limit of 1,000 subscribers. If you make your payment on the 20th day, you will pay $18.30 and the accounting period will last for 50 days, as shown in the diagram below. Again, it is the same situation described above with with an additional fee for the time period before payment was received. Remember that you have 30 days to purchase a new plan that will accommodate the size of your growing database. If no payment is made after 30 days, your account data will be deleted. Let’s say you pay $14 a month and after the accounting period is finished your database exceeds its limit of addresses. You have 30 days in which to make a payment for a higher plan. If you make a payment on the 60th day - the maximum after your database exceeds your plan - you will pay $46 and it will be valid until the 90th day, as shown in the diagram below. I paid for the Unlimited plan for 12 months in advance. The size of my database has increased but I didn’t pay immediately for a higher plan. In this case you will pay for the difference between the higher and lower plans. 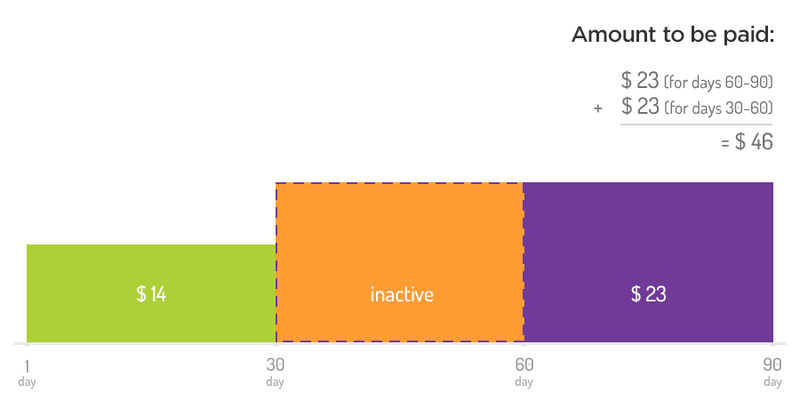 It will be calculated from the moment your subscriber database exceeded your current limits. Let’s say that you have an Unlimited plan for 12 months and you paid $168 up front ($14 per month). After three months your subscriber database exceeds the limit allowed. You make a payment for the new plan after 30 days have passed, which is the beginning of the fifth month. 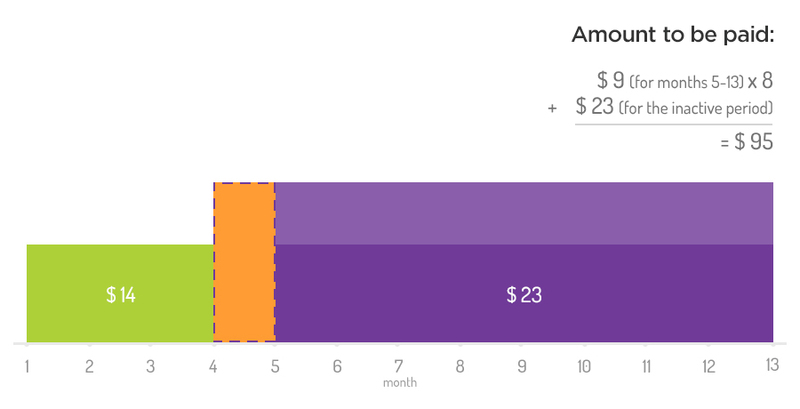 For the new plan, you pay $23 for the month that FreshMail stored your data plus $9 for each new month of the new plan ($72), as shown in the diagram below. 7. I have an Unlimited plan and my database decreased during the accounting period - how do my payments change? If your subscriber database has decreased in size, you can move to a smaller plan that is appropriate for the new number of addresses you have. You can do this after the current accounting period has expired. Remember that if you are using a credit card to make payments, the system will automatically apply charges the same as the previous billing period. This means that you have to manually change plans before the new charges are made. You have a maximum of 30 days to make your next payment. During this time, FreshMail is storing your account data and you can log in at any time without being able to send a campaign. Even if you change to a smaller plan, you are still obligated to pay for the time period that FreshMail hosts your data according to the terms of the previous plan. Let’s say that you pay $23 a month and you fail to make the payment for the new accounting period. During this time the number of subscribers in your account falls below 1,000. On the 60th day you make a payment for the new, smaller plan - up to 1,000 subscribers at a cost of $14. 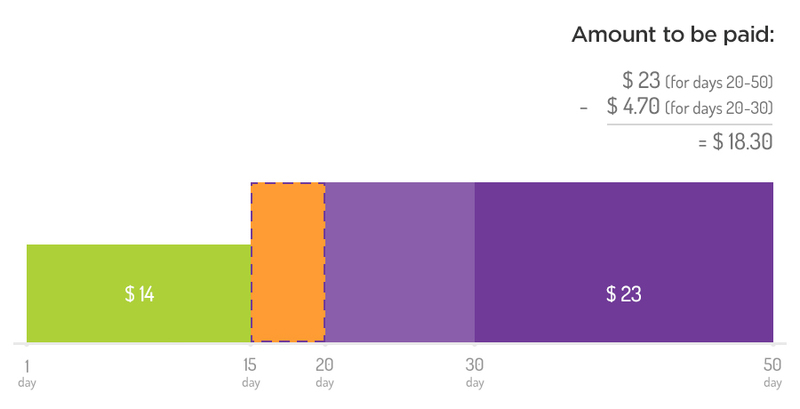 For the new plan, you will pay $37 ($23 for days 60-90 + $14 for the period that FreshMail hosted your data, days 30-60), as shown in the diagram below. 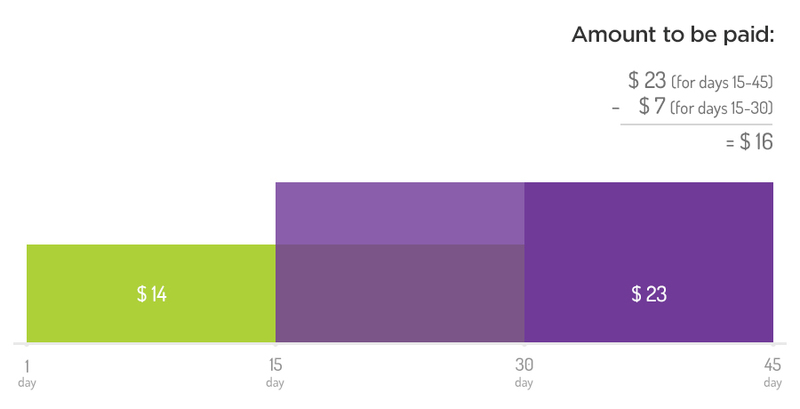 I paid for the Unlimited plan for 12 months but my subscriber database is smaller now. Can I change to a smaller plan? Yes. When the size of your subscriber database decreases, you have to log in to your FreshMail account and manually choose a smaller plan, no matter what form of payment you have chosen. Excess available credits will be automatically calculated based on the size of size of your current database and used to extend the period your account will be active.